How Much Weight Can Flat Commercial Roofs Handle? HomePonding Water 101Ponding Water 101How Much Weight Can Flat Commercial Roofs Handle? As an owner of a new commercial business, you’ve perhaps decided that a flat roof is the best construct for your building. While this is common for many businesses, you have to consider some of the risks involved like standing water, and snow. 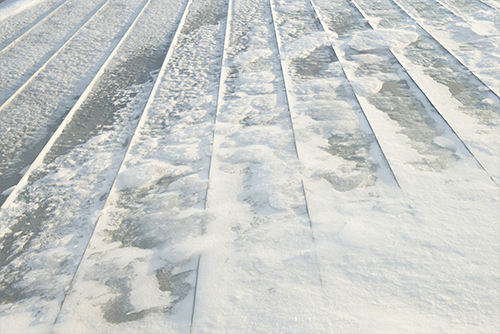 If you live in overly wintry climates, snow could pose huge problems for your flat roof in terms of weight. Then you have another concern: What if you have vehicles parking on your flat roof? Do you really understand how much your roof can handle? As many roofing experts note, far too many commercial businesses don’t pay enough attention to how much weight their flat roofs hold. Snow and vehicles are only just some of the concerns you should have. You may also have considerable foot traffic up there, or store equipment long-term. Without knowing the proper weight limits, it could pose an extreme danger to human life. So how much weight can a flat commercial roof handle? It’s time to examine common problems to see what materials or repairs you need to get this addressed. Flat roofs are extremely vulnerable to standing snow, and this could easily cause a roof collapse without removal during a blizzard. It helps to follow some guidelines first from the Insurance Institute for Business & Home Safety. They tell you exactly how to weigh snow before you have any dangers of a collapsed roof. Basically, you’ll need to check if you have over four feet of new snow before your flat roof has any dangers. However, only two feet of old snow could equally start to become a risk. When you add two feet of new and old snow to flat roofs, it starts to go beyond the weight capacity of most roofing surfaces. the IBHS also notes one inch of ice equals one foot of snow. What is Your Expected Structural Load? Before creating a new flat roof, or having it rebuilt, you need to calculate what your expected structural load is. You calculate this in pounds per square foot, or usually abbreviated as PSF. In this scenario, you’ll determine how much continual weight your flat roof gets, whether from people walking on it, driving over it, or what kind of weather you regularly experience. You need reliable roofing expertise when having to recalculate PSF due to added roofing materials. Too many materials could increase weight and cause structural problems later. An expert roofer is going to check the strength of your current roof first before applying anything new. Some roofing materials are stronger than others, so it’s important to get a roofing team accurately measuring your building’s support system. One of the strongest roofing materials for flat roofs is sprayed polyurethane foam. It’s a two-component liquid that creates a rigid foam surface. With this, you have a material strong enough to hold the weight of vehicles. Regardless, many prefer to use concrete on their commercial roofs, despite being quite heavy. Metal is extremely popular as another option, and it does fairly well with limited weight because of its pliability. Despite SPF being one of the most durable, what other materials can you use to help, especially if you have ponding water problems? Ponding water is another problem adding some weight to your roof. Here at RoofSlope, we’ve created a product that brings an easy way to fill in low spots on your flat roof without adding considerable weight. It’s intended to create positive slope so you gain proper drainage all year, including from accumulating snow during the winter. Contact us to find out more about how weight affects flat roofs and how our products can keep your commercial roof in perfect condition for years to come.